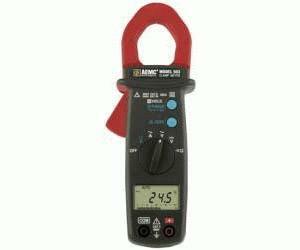 The Clamp-On Meter Model 503 is a general-purpose professional clamp-on. A strong mechanical case design, quality materials, full ranges and compliance to international safety and quality standards ensure a professional and reliable tool. The Model 503 is auto-ranging, and provides the user with AC Volts, DC Volts, AC Amperes, DC Amperes, resistance and continuity. The large and complete 4000-count LCD features comprehensive user interface symbols such as a low battery indicator. It is equipped with a Data Hold function, which freezes the measurement. The Model 503 is compact for comfortable one-handed operation, and the hooked jaw design is easy to maneuver in crowded wiring and breaker panels. The jaw opening for the Model 503 is 1.1 inches (28mm).